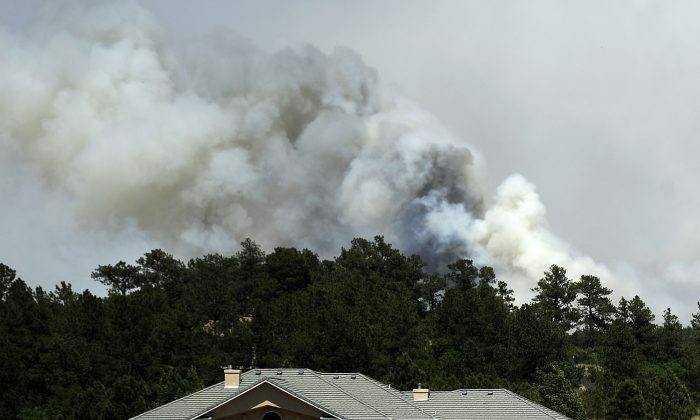 John Bissett, president of the Housing and Building Association of Colorado Springs, had been following the news of the Black Forest Fire burning near his community in northern El Paso county. With the winds changing directions, and the mandatory evacuation line drawn to Walker Road—just three quarters a mile south—he started packing what he needed into his motor home, along with his two cats. He started packing about four hours before he received the reverse 911 call at his home alerting him of the mandatory evacuation. “Then about 20-30 minutes later the police and sheriffs came into the community and went door-to-door to make sure everybody was getting out, or got out,” Bissett said. He left his house around 6 p.m. MDT on Wednesday, June 12. The Black Forest Fire has destroyed at least 379 homes. An online list of homes either “unaffected, partial damage, total loss, or unverifiable,” is updated regularly by the El Paso County Sheriff’s office. “Those numbers are pretty staggering,” said El Paso County Sheriff Terry Maketa, who spoke at a televised news conference early Thursday. Bissett knows people who have lost houses. The fire has consumed 15,000 acres, according to Maketa. Bissett lives in a community where the houses sit on 2.5 to 5 acre lots. “It’s pretty good size lots and on country roads,” he said. During the evacuation he saw a steady stream of cars exiting the community toward the freeway. Fortunately, it was a steady drive out without gridlock at that time. “My friends came up to assist me and said that at about 3:30-4:00 p.m., the freeways were just absolutely a parking lot. People were trying to get out,” he said. “Last year helping some friends evacuate when the Waldo Canyon fire hit, all of the roads became one-way roads. It wasn’t unusual for cars to be driving on the opposite side of the road exiting,” he said. The Waldo Canyon fire started near Colorado Springs on June 23, 2012 and destroyed 346 homes. Last year, Bissett hosted people who had been evacuated at his house. In Colorado Springs, he said there’s not really a lack of places to stay during wildfires. “I actually spent the night in a grocery store parking lot last night,” he said. But he was offered a place to stay at his friend’s homes, or a place to park his motor home. His neighbors are staying with their friends. “There is such an outpouring from the community that very few people actually take advantage of the Red Cross established shelters,” he said. Wednesday, since his instincts gave him an early start, his mind was focused on saving sentimental belongings and important documents, loading what he could into the motor home, “without any thought for being able to get around in a motor home once everything was in,” he said. It’s a luxury, according to Bissett, to have time to think about what kind of clothing to pack before an evacuation. “Somebody told me once upon a time that I need to ‘make sure you take your dirty clothes hamper with you because it has clothes you wear normally.’” He packed his dirty clothes. Thursday, he took his cats to a friend’s house, dropped off some other things, and made his motor home a little roomier to live in for a bit. Now, he’s just waiting. “I think this is going to be a few days before the evacuation is lifted,” Bissett said. Friday he’s going back to work and plans on keeping an eye on the news on the television. “There is really not a lot that can be done at this point,” he said. “To have two of those kinds of fires in 12 months is unbelievable,” he said.